The Zimmern Anamorphosis, an anonymous double portrait of a prominent Swabian jurist and his wife from the 1530s, prompts viewers to hunt for their figures amidst a pictorial narrative and then to recall and mentally recompose its hidden parts. This animated mode of reception guides viewers through a perceptual paradox that integrates a memorable history into its subjects’ bodies. Besides legitimating worldly privileges, this painting demonstrates how anamorphosis supports images’ traditional functions as instruments of memory. Capturing period anxieties about dynastic representation and the precariousness of social status, this painting foregrounds vision’s contingency and anchors immaterial memory in a more durable memorial object. eyed awry / distinguish form. This essay concerns an anonymous, early-sixteenth-century panel painting from southern Germany: the Zimmern Anamorphosis, of circa 1535 (fig. 2), whose pair of portrait subjects—Wilhelm Werner, Count von Zimmern (1485-1575), a university-educated magistrate of the Imperial Chamber Court (Reichskammergericht) at Speyer (fig. 3), and his wife, Amalia Landgravine von Leuchtenberg (ca. 1469-1538) (fig. 4)—appear not merely misshapen when seen from front and center but wholly unrecognizable.6 Like Leonardo’s drawing of a disembodied eye, this painting enlists viewers as active agents of an optical transformation. Its width is similarly exaggerated to about four times its height (excluding the frame), but in contrast to the elongated eye, the painting’s largest figures cannot be recognized at first glance.7 It is the viewer’s task, as Shakespeare implied, to locate a position from which to “eye awry” such a “perspective” in order to “distinguish form.”8 This passage in the play reveals that period viewers were aware that a picture’s effects depended on particular subject-object relations. It also shows that their responses to images concerned how to look, rather than how to make. Moreover, it suggests that they were aware that the normative (“rightly gazed”) viewing mode that entailed a fixed, centered vantage point sometimes had to be exchanged for a more flexible approach. Recent studies of anamorphosis as an early modern mode of representation have emphasized how it challenges the dominant pictorial system for rationalized illusionistic space (i.e. linear perspective) from within that system.9 In contrast, I aim to describe how anamorphosis corresponds with an alternate mode of reception that is rooted in the variability of spatial relations between mobile viewers and mutable images. This essay examines how the viewing process itself amplifies the meanings of one particular painting. Unlike Leonardo’s two simple figures, which remain entirely visible and identifiable from any vantage point, some portions of the Zimmern Anamorphosis are imperceptible when the panel is regarded from the front and other portions are invisible from its margins. Even more intriguing than the panel’s structure—to be described in greater detail below—which requires viewers to play hide-and-seek with its content, is the way that its masking and revealing complements the painting’s iconography. Just how does the experience of gaining and losing sight of parts of the image produce meaning? I contend that this painting’s idiosyncratic structure prompts viewers to revitalize its content and function as they look. Thus, what makes the Zimmern Anamorphosis so unusual is not simply the fact that the viewer can optically correct the initially confusing, nonmimetic brushstrokes into a pair of portraits by regarding the panel respectively from its left and right margins. More important for our understanding of early modern ways of seeing is how this painting is ideally suited to a mode of reception that engages each observer’s visual reminiscence to mobilize more durable, material forms of memory. The first generation of sixteenth-century anamorphic images—including Leonardo’s drawings—are strikingly similar in subject and format and tend to depict faces. Before the 1580s, when artists began to employ a variety of techniques, figural proportions were typically elongated in one direction. Most familiar to modern viewers may be the large double portrait of courtier Jean de Dinteville and Georges de Selve, bishop of Lavaur, known as The Ambassadors, by Hans Holbein the Younger (1497/98–1543) (fig. 5), of 1533, as the earliest extant use of anamorphosis in a painting designed for an elite social context.16 Notably, Holbein used the novel technique to disguise neither his illustrious sitters nor the measuring, musical, and representational instruments on the double-decker table between them but reserved it for the exposed human cranium that hovers over the patterned marble floor in the lower foreground. At first view, the skull’s proportional logic contrasts with its surroundings, but as one moves farther toward the right, the object’s width seems to contract until, from a particular, unmarked, and relatively elevated vantage point, its form appears as naturalistic as any of the nearby volumetric objects on the table.17 If taken as an allegory of spiritual and worldly epistemologies, the instruments for measuring the world and expressing its fields of knowledge occupy an illusionistic space that facilitates perspicacity. Juxtaposed with this model of human attainment, the symbols for mortality and salvation in the skull and the foreshortened crucifix at the green damask backdrop’s upper left edge require greater perceptual effort.18 Standing paradoxically for both vita transitoria and vita permanens, Holbein’s skull thus represents a synthesis of the ephemeral and the eternal. As an optically unstable memento mori, it alerts viewers to the changeability of (their own) human perception. Eying the image “rightly” produces faulty proportions in a figure that represents something hidden within each and every viewer. To “correct” its proportions requires them to adjust themselves to the image. The Zimmern Anamorphosis embodies another type of perspectival paradox that we might call the “imperceptibility of the perceivable.”19 By this I mean that although every stroke of paint on the panel’s oblong surface is fully visible from a central vantage point, much of its surface is devoted to figures that cannot be recognized from that position. Some of its content, however, is comprehensible when seen at close range. Numerous classicizing gilded paper and papier-mâché friezes run side-to-side across its original monumental wooden frame.20 Inset into the frame are six papier-mâché male heads molded as portrait medallions (http://objektkatalog.gnm.de/objekt/WI717), two of which can be traced to extant models in metal.21 A forest setting containing diminutive figures hunting on horseback occupies approximately the upper fifth of the painted panel. Positioned at intervals across the panel’s base are equally small pairs of male and female figures accompanied by coats-of-arms. Interspersed between the members of this abbreviated family tree are fragments of an inscription in black roman characters on an off-white background. Above this lettering, other figurative elements are distributed across the painting’s middle, such as men on horseback, trees, and a tiny gray building in the center, whose tall windows end in pointed arches. These dispersed components constitute a Zimmern family legend, known as the Stromberg Legend for the name of the forest in which it occurs and also as the Legend of the Miraculous Stag.22 Before recounting that legend, I will first outline how this painting functions. First and foremost a commemorative work of art, the Zimmern Anamorphosis operates on several levels. One of its original functions would have been to integrate its initial viewers—primarily family and guests of the counts of Zimmern—into a collective, dynastic identity. Read literally, the painting’s narrative iconography and semiotic content present that family’s efforts to secure its aristocratic privileges in the 1530s.23 Early viewers would have reactivated the painting’s commemorative purpose and internalized its hortatory messages, which urge viewers to adopt a particular behavioral code demonstrated through positive and negative examples.24 By heeding the implicit warnings in its figural representation of oral legends, viewers would transform them into memorable historical narratives to be passed on to descendants. Perhaps they would also have become more conscious of familial duty. Standard art-historical questions about who commissioned and executed the painting, as well as its early provenance, may remain unanswered.25 Since its surface has been retouched more than once, the painting remains unattributed. Nor is it listed among the art and furnishings first inventoried in 1623 for the Zimmern heirs, although it may have been noted in 1663 and 1738 at their nearly unoccupied Castle Wildenstein on the Danube.26 Its complexity suggests that multiple hands were involved and its figural scenes are reminiscent of the graphic production of numerous artists active during the second quarter of the sixteenth century in southern Germany. Despite the lack of external confirmation, we may reasonably posit the painting’s initial functions. Both its manner of presentation and iconography argue for the legitimacy of Zimmern social privileges.27 Together, they reveal the Zimmern Anamorphosis not only as a manifesto of noble identity rooted in specific sites—as denoted by its narrative content—but as an invaluable demonstration of a mode of reception that produces meaning through remembering and re-membering—recalling and re-forming—pictorial effects. Thus, this painting’s significance extends far beyond one family’s self-conception and social relations. As an artifact of visual practices at the time, the Zimmern Anamorphosis provides insight into the processes of visually exploring, finding, and then losing sight of parts of an object before ultimately producing a more complex, inwardly-constituted image than the external pictures that provide its stimulus. It is important to remember that the semantic fields of contemporary words such as the Latin imago and the Middle High German bilde include both immaterial, noetic visual phenomena—mental images—and external, material artistic pictures.28 Accordingly, viewers now as then actively make their own meanings from the Zimmern Anamorphosis by mentally juxtaposing spatially disparate pictorial elements that cannot be seen simultaneously. A work of art whose form, content, and manner of reception complement each other so thoroughly because of viewer mobility is exciting, because until just recently, art-historical narratives have tended to privilege the ideally immobile mode of reception required by the system of linear perspective. Although this is not always stated, the normative mode of viewing is presumed to be stationary. The mode of reception suited to the Zimmern Anamorphosis, however, utilizes variable viewer emplacement for the sake of embodied spatiotemporal relations with the image as physical object. The artist who created the Zimmern Anamorphosis was keenly aware of how spatial relations affect what one sees. Three techniques render the portraits unrecognizable and their inscriptions illegible from the normative vantage point. First, their proportions are exaggerated horizontally; second, the panel is not flat, but formed into a wavelike surface (fig. 6). Six sharp, vertical ridges separate seven concave fields. These centimeter-high ridges are built up with a layer of gesso between the fine canvas and its wooden support. Third, the two portrait subjects are intermingled with each other (fig 7 and video). Each figure breaks off where it abuts the other, except across the center, where the two faces join in one horizontal smear punctuated by the light red line of their lips. The gently undulating surface prevents this smear from being seen from either side. Elsewhere, the transitions are concealed by narrative elements, such as the encounter between two figures in the top center, the riders on the left, and the chapel in the middle. They are also hidden under suggestive, irresolvable forms, such as the flat gray curves on the right. None of these figure into the portraits, nor can they be seen from anywhere but the front. From that position, however, distortion, intermingling, and antirepresentational paint render the portraits unrecognizable. Paradoxically, although we perceive the subjects’ presence in the composition, their particular identities are imperceptible. Within the painted panel, the way color and shading are used—one could say, the basic artistic grammar of naturalistic representation—does not always align with how we expect objects from the world around us to be depicted. Certainly, some forms, especially the portraits, to which I will return, appear mimetic only from the painting’s outer edges. Other, smaller-scale figures are recognizable at close range and require one to move across the panel to examine the story’s separate sections. This narrative figuration communicates the social ambitions and memorializes the lineage of the lords of Zimmern at a moment in their ascent when their hereditary title of baron was being elevated to that of count. Along the panel’s lower edge, a row of diminutive male and female figures signifies the importance of parentage. Standing by their coats-of-arms, these men and women represent important marital unions in the Zimmern family tree over four centuries.29 There are six heraldic devices in total. Three represent the arms of the lords of Zimmern: an axe-bearing, rampant golden lion on a dark blue ground. The other three unique escutcheons bear the insignia of their wives. Each of these women represents an advance in social status for her husband’s family. The single, unattended shield to the right of center would have been reserved for a marriage in the next generation. Lacking both attendant and counterpart, it was surely intended to be matched with another crest once the next head-of-family was ascertained. Placing the then-juvenile eventual successor, Froben Christoph von Zimmern (1519-1566), in this position would have been premature, since in the 1530s, both his father and an elder brother were still living. The presence of this lone escutcheon signifies an anticipated future union. Neither the vision of the silent feast in the evanescent castle nor its horrifying disappearance are depicted in the painting. 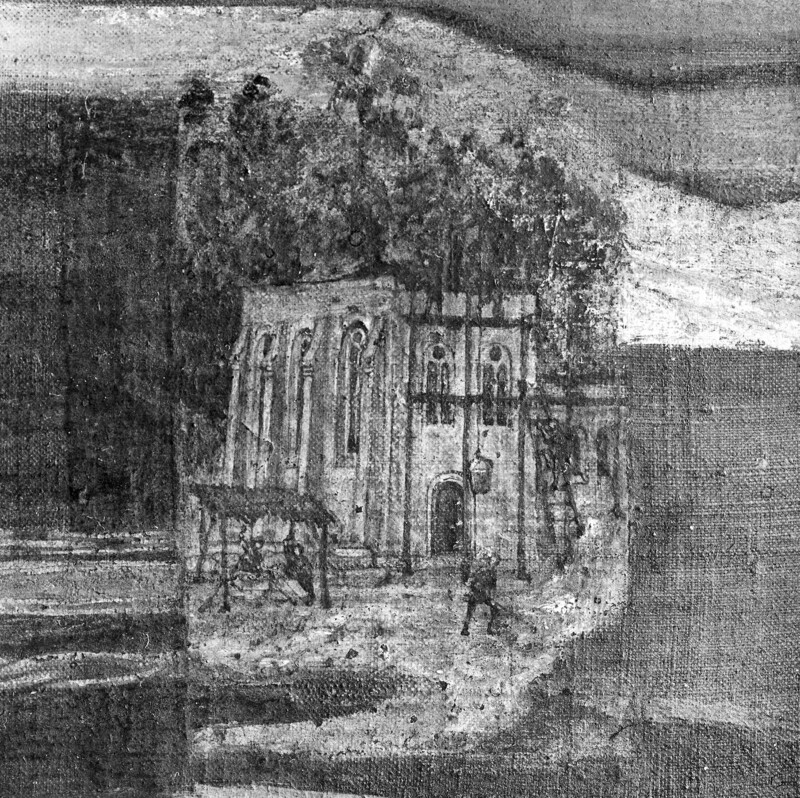 According to the legend, to make amends on behalf of his ancestor, Albrecht immediately sought permission from his host, whom the chronicler calls Erchinger, Count von Monhaim, to found a nuns’ abbey on the site of the apparition, starting with its chapel, which is depicted at an early stage in the painting’s center (fig. 8). This scene represents the first step in Baron Albrecht’s religious donation to atone for his ancestor’s sin: the future Frauenzimmern convent. In this finely detailed vignette less than two inches high, several stonemasons are occupied on the scaffolding across its facade. Another worker stands in the pebble-scattered yard, and by the buttressed side wall, two stone carvers sit in an open-sided workshop. Several inches to the left, two additional riders look at each other and gesture toward the chapel from separate islands of vegetation. Like the literary topos of a frame narrative, a story within a story, the culminating moment, as the chapel materializes, is visually framed above and to the side by the larger narrative of the hunt gone astray. Although ultimately a piece of fiction, Albrecht’s vicarious act of atonement is made visible in the construction of the building in the center of the Zimmern Anamorphosis. Through this gift to future generations, he would have hoped to repair damage incurred in the past. The potential spiritual value of his uncle Friedrich’s intended mission against non-Christian inhabitants of the biblical lands was nullified by the violent means of enlisting troops. In a simplistic Christian model of feudal social relations, peasants were tasked with laboring and the nobility with raising arms to protect the rest of society, especially their peasants. By exploiting his peasants’ service, Friedrich not only led them to their deaths but also strayed from his own ordained role. Such is the extent of the recognizable figuration from a normative vantage point. Most of the panel’s surface is not dedicated to the Stromberg narrative. For example, above the row of genealogical figures is an irregular, off-white plane that shifts at sharp angles as it crosses the panel from side to side. It is covered with wide black roman letters, most of which are individually legible, but the words they spell are not. Closer examination reveals that some characters are not even part of the Latin alphabet, although they use its formal components of vertical, horizontal, and diagonal strokes, including serifs (fig. 9). These pseudoletters’ illegibility may be the viewer’s first visual cue that something is here to be read. First, however, the text that lies askew must be deciphered—an impossible task, since most sections of the inscribed panel contain scarcely more than two adjoining letters between breaks in the script. Not just (il)legibility (of script) but (un)recognizability (of other forms) are this painting’s themes. Within the larger framework of a family legend, mimetic elements play hide-and-seek and elude recognition, even though from a centered vantage point, viewers can recognize objects that do not figure into the narrative. Perhaps the most arresting of these disconnected signs is a fully formed human eye that seems to float—independent of a face—above the white-haired rider on the left (fig. 10). Tipped up where it might join the bridge of a nose, this eye is less distorted than the one Leonardo drew in his Codex Atlanticus, but its slightly widened proportions suggest that it, too, may be optically corrected—in this, it is doubly appropriate that it is an eye—if it could only be seen from another angle. Yet from the lateral vantage point, from which one might expect to resolve the distortion, this eye cannot be seen at all. As a representational element, the floating eye is not part of a face whose other features are yet to be discovered. The eye disappears into one of what I call the painting’s “blind spots”: recessed areas that I equate to zones around the periphery of a vehicle, which are hidden from the driver’s view by the vehicle’s own frame. Because the painted panel is not flat, although it may appear so from a central vantage point, looking across the panel from each side reveals only what is painted on the far side of each concave field (fig. 11). Since the anamorphic painted eye gets obscured before it can be optically re-formed, we must conclude that it signifies something other than a ubiquitous gaze. From an oblique angle, viewers are also hidden from it. By calling the viewer’s attention to this fluctuating sign of visibility and disappearance, the eye effectively evokes the relationship between vision and memory: what cannot be seen must be recalled. Forms above the inscription complicate perception still further. On the right, rising from the lettered plane to the hunt scene above is a sequence of intertwined gray curves thinly outlined in black. At the top, a horse and rider seem to leap over this two-dimensional shape as it bursts into their space. But does it belong to their narrative? Its unmodulated color enhances its flatness and contrasts with its surroundings. If this suggestive but unidentifiable figure contributes nothing to the Stromberg Legend, why does it intrude into the uppermost register? Instead of signifying mimetically, it and the other, seemingly antirepresentational elements—including the nonsensical parts of the inscription—serve other pictorial functions. Their placement within the larger composition cannot be coincidental. They are not there to smooth out perceptual disjunctions but to enhance them. The floating eye is an index for visual complexity and a sign that stands for sight itself. The hunt topos signifies the viewer’s task. The decoy letters, the elongated yet recognizable eye, and the antirepresentational brushstrokes appear from the front as optically resolvable as the rest. But from no vantage point—neither from the front, nor from the side—do they represent identifiable objects or legible letters; they simply thwart recognition. They play no role in the portraits when those are seen from the marginal vantage points. In fact, from those positions, these areas of the panel cannot be seen at all. Fixating on them while moving to the side does not stop them from vanishing into the blind spots. From the sides, the curved surface fully conceals the floating eye and the intertwined curves, along with the two gesturing hunters, the barefoot revenant, the genealogical couples, and the chapel. Reading the incomprehensible signs or indices in combination with the narrative iconography reveals that an act of looking can be a hunt whose elusive quarry is pictorial stability. When a viewer moves toward the outer margins, even the massive stag escapes into a blind spot. What, then, does a viewer gain by moving to the outer edges and gazing across the picture plane at an extreme, oblique angle? From there, the figural fragments optically shrink and coalesce. In place of one tantalizing, deceptive eye are two eyes, set into a naturalistically proportioned face. In fact, there are two faces, on a much larger scale than the figures in the narrative and genealogical scenes described above. The panel contains two bust-length portraits, but only one may be seen from each side. Additionally, from the sides, the irregular, lettered plane has recomposed—ana-morphed, as it were—itself as a pair of upright, inscribed tablets, upon which the subjects’ names and titles are finally legible despite being abraded. According to the inscription, the likeness on the left is that of Wilhelm Werner, Count (and lord) von Zimmern, age fifty; and on the right, that of Amalia, Baroness von Zimmern and Landgravine von Leuchtenberg (fig. 12).43 Below the inscription are incomplete dates that can be read from each side and two larger shields topped with crest figures: on the left, a bright red stag, and on the right, a black-and-white anthropomorphic head. The large scale and equal size of the two intermingled portraits is significant, even if they appear distorted from the normative vantage point. The expanse across which they are depicted, however, supports the genealogical lineup and the founding myth, which concern all subsequent generations, not just family members who were alive when the painting was new. The normative frontal aspect foils the primary goal of physiognomic portraiture: recognizability.44 Below the figures, the disjointed alphabetic and alphabetlike characters thwart another means of identification. The titles inscribed under the portraits in the Zimmern Anamorphosis are important to understanding how the painting asserts not just physiognomic identities but also social status. Physiognomy and text are but two facets of how this painting represents its subjects. The two portraits are, despite their size, submerged within the illustrated family legends and heraldic devices. Alternatively, the collective components are embedded in the larger figures of Wilhelm Werner and Amalia. Either way, four hundred years separate the two sixteenth-century faces and the twelfth-century legend, but the heraldic devices anchor a collective, multigenerational identity. Coats-of-arms represent not individuals but noble offices grounded in particular places. The second estate’s investiture of identity in hereditary, immobile property was intended to insure against being forgotten. Acquisition, loss, and recovery are steady themes in their self-representation, as encounters with this painting demonstrate. The stag hunt provides the premise for a nobleman’s venturing into the woods, a potentially uncharted region where wanderers can get lost. Losing sight of a target and going back to retrieve it is part of how the Zimmern Anamorphosis is experienced. 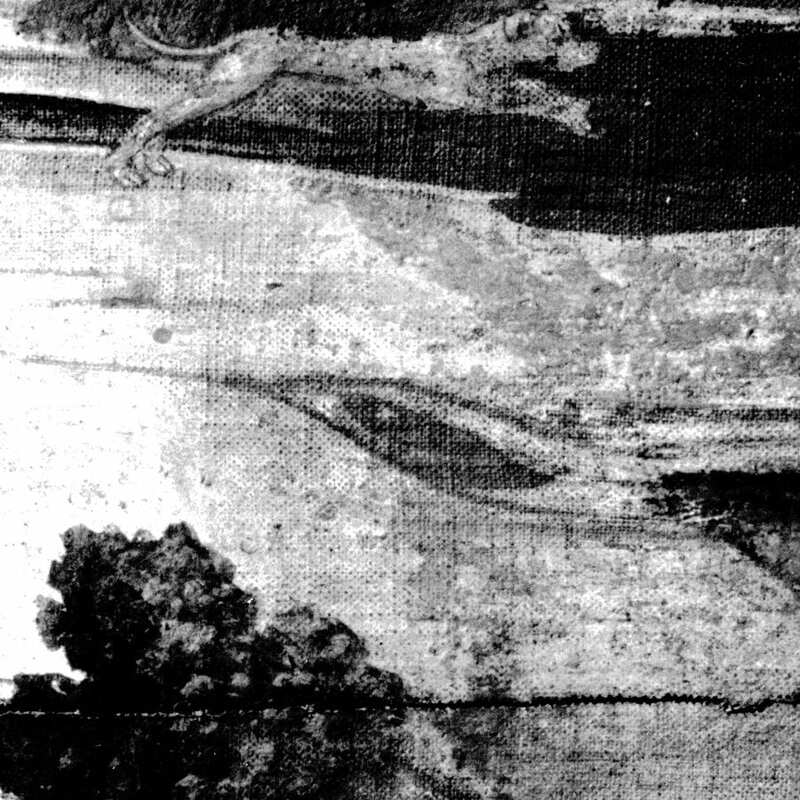 When seen from the side, parts of the forest and some of the hunters and dogs remain visible along the panel’s top, even though this imagery appears pulled out of proportion and vertically elongated. When the faces are “eyed awry,” they become the central focus; it is the hunters above that move into peripheral vision. Arresting the portraits in perfect proportion is an impossible task. A viewer must refocus after the slightest movement—even an involuntary blink. As a type of picture that northern European audiences of that era would have associated in various ways with concepts of “perspective,” the Zimmern Anamorphosis demonstrates how an innovative artistic effect need not depend on simultaneous visibility but could signify meaning through the way in which viewers must perpetually exchange one view for another. 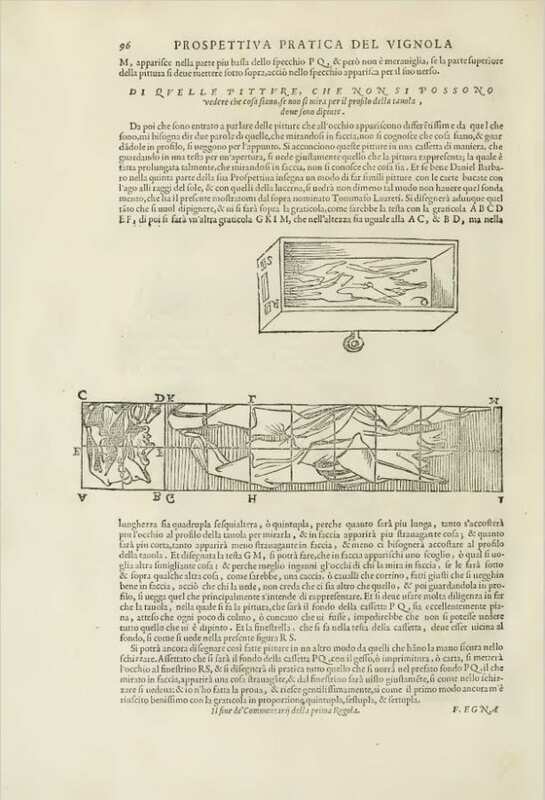 This process contradicts the first illustrated instructions for constructing and viewing an anamorphic head in profile on a flat surface, which mathematician and astronomer Egnatio Danti (1536–1586) culled from the writings of architect Giacomo Barozzi da Vignola (1507–1573) and published in 1583.45 Danti cautioned that to enable the ideal lateral gaze across an anamorphic image, the surface to be painted must be perfectly flat, “because any little bump or concavity would prevent one being able to see everything that is painted there” (fig. 13).46 Attributing the construction of partial views to faulty execution, Danti asserted a normative mode of viewing based on comprehensive visibility.47 By assuming that viewers should be able to apprehend an entire pictorial program at once with their physical eyes, he ignored the roles that mental images and visual memory play in perception. He did not consider a different mode of viewing predicated on moving through multiple vantage points to form mental composites of objects that cannot be perceived in their entirety from any one position. Supporting the tenacity of this latter viewing mode, however, are the partial views and elusive imagery that serve existing uses of images to prompt memory. Here I mean not the ars memorativa (the art of memory)—ancient methods for training the mind to reconfigure received knowledge in order to perform rhetorical feats—but rather memoria as the mental facility to recall what was once perceived and no longer physically present. A picture may guide perception and recall to prompt remembrance. It would be all too easy to dismiss a mobile visual mode and the pictorial structures it serves as lingering traces of a medieval mindset that was supposedly replaced by “rationalized” sight in the Renaissance, since they do not comply with the stationary, simultaneous mode of viewing required by the system of single-point perspective. We should instead regard this as an alternative visual mode, one that serves as a powerful means of conditioning a frame of mind that we may conceptualize—to use a modern term—as self-perception. This mode of viewing, which recognizes the impossibility of a ubiquitous gaze, draws attention to the contingency of the individual viewer’s subject position. With the Zimmern Anamorphosis, it correlates to the nobility’s fear of dynastic extinction through loss of territories and names. The theme of forgetting—or more precisely, fear of being forgotten—pertains to one of the painting’s primary functions: to assert aristocratic entitlement. Typical for members of the second estate, from at least the end of the fifteenth century onward, the Zimmern clan—like other fragile noble dynasties—perceived threats to its livelihood and formerly exclusive privileges from multiple angles. First, they were losing professional opportunities to new classes of urban merchants and educated commoners, who gradually assumed the rights and duties, wealth and power, formerly reserved for their social superiors.49 Second, nobles were aware that their place in the social hierarchy and its tangible means of support—land—was precarious. A lack of male heirs could lead to the extinction of a family name entrenched in a particular location—and with it, communal renown, the clan’s memory.50 Moreover, fewer liquid assets to circulate through daughters’ marriages meant social petrification, not mobility.51 Finally, political missteps or misalliances could also precipitate the loss of hereditary territory to clans of equal or higher rank. As part of its hortatory mission, the Chronicle urges preserving hereditary legacies in the face of splintering factions and disputes among the leaders of noble houses, which it portrays as shortsighted measures that imperil these families’ survival.52 Besides offering a tangible means of anchoring the bygone in the here and now—as does any memorial work of art—the unusual structure of the Zimmern Anamorphosis draws attention to the tenuous nature of human memory and the perils of forgetting—first, for the nobility in a late feudal context, and second—and more importantly for the study of early modern images—within the context of that period’s visual paradigms. The Zimmern Chronicle describes how the barons of Zimmern convened in 1537 to campaign for the “return” of their rank of count, a title which—as told later by the chronicle writer, who was most likely their nephew, Froben Christoph, Count von Zimmern—they had held unofficially some four hundred years earlier.62 In their campaign for social promotion, the brothers had called attention to their noble habitus, characterized—in the sense given this term by Pierre Bourdieu—by loyal imperial service, deep roots in specific sites, aristocratic wives, and prior territorial autonomy.63 The Chronicle grants Wilhelm Werner special credit for having loyally served the Holy Roman Empire at Rottweil and Speyer.64 Rather than pitching the family’s campaign for privileges as an attempt to gain a new rank, the chronicle writer later attested, they sought official reinstatement for a “lapsed” title. He justified this claim by noting his uncles’ then-current imperial service and a history of marriages with the daughters of higher-ranking nobles.65 “Intermarriage,” reminds Thomas A. Brady, Jr., “is ever a sign of relative social equality and social acceptance.”66 The line of ancestral figures and heraldic devices representing important genealogical connections along the painted panel’s base is a statement of upward mobility via matrimony, as are the larger integrated portrait figures. The convent chapel is anchored in a particular moment: the initial act of donation. The language used for private gifts to finance new ecclesiastical branches, often expressed as fundatio, or foundation, reveals that location, or ground, is ingrained in such acts of endowment (dotatio). Charters documenting the origins of religious communities customarily list under the heading, “fundatio [et dotatio],” the names of founders, places, religious orders, and governing Church authorities. The spatial importance of a new religious house extends to building costs, whose value may be reckoned as land (fundament) that will become the chapter’s means of support. Deriving from the Latin fundus, “bottom,” the word foundation indicates a supporting surface, base, as well as “a piece of land.” The nascent chapel depicted in the Zimmern Anamorphosis will rise even higher; building its roof would be the next step. In his Etymologies, a medieval source still esteemed in the sixteenth century, Isadore of Seville differentiated the functions of open fields according to the powers that control them. “An ‛estate’ (fundus),” he wrote, “is so called because the family’s patrimony is founded (fundare) and established on it.”68 To successfully create a foundation that will outlast its donor requires not only an immovable place but also commitment to the techniques and media of memory, such as commemorative works of art. Acts of fundant (founding) would customarily be followed by erectant (building), confirmant (confirming), and ornant (furnishing with altars, windows, and pulpits, etc., and adorning with works of art). Images did not always accompany an initial founding act but were often put in place long afterward to commemorate earlier events. Although the Zimmern Anamorphosis conveys a narrative that leads to the founding of a convent, the purpose of its depiction of the physical structure is not to commemorate that chapter’s origin as an important moment in the spread of Christianity nor to honor an extant (religious) order. For that reason, the painting need not follow the iconographic conventions of the donation genre, which began in manuscript illustrations that accompany textual accounts of chapters’ origins. Paintings and sculptures commemorating the founding of ecclesiastical communities tended to follow standard iconography until the early eighteenth century. Spiritual and worldly donors occasionally appeared alone, but frequently they were depicted kneeling before the Virgin Mary and/or the patron saints to whom their building was dedicated, proffering a miniature version for blessing by heavenly intercessors. Such works of art were not only intended to remind viewers of an order’s local history; they also commemorated acts of founding and architectural intentions, and they provided legal bases for donors’ descendants to assert their prerogatives for regional control. In contrast, Baron Albrecht is not depicted in the same central vignette as the endowed building, nor are any holy figures in sight. The convent built at the culmination of the Stromberg Legend marks the (supposed) Zimmern material investment in a location and in their own noble identity in the guise of a spiritual bequest. More important than its effects for the lives of twelfth-century monastic women is its message that the then-current generation of nobles were conscious of their duty. The portrait subjects and the Stromberg narrative are on two different scales, occupy two different levels of reality, and exist in two different time frames, and the painter has made sure that viewers also experience the portraits and the narrative in separate moments. Although comparatively little time elapses during the viewing process as the beholder physically relocates from the center to the margin and back again, it is enough to recognize that duration is part of this mode of reception, as is gathering what one sees at center, left and right. Viewers must be able to connect disparate elements—portraits, heraldic devices, landscape settings, and active figures—and speculate on their relationships. The encounter between the ragged, apparitional man and Baron Albrecht represents a miraculous overlap of the living and the dead. The founding of the chapel—regardless of its actual patron—would have been understood as a public gesture to the past, intended to balance a score on behalf of those who had failed to do so while living. Its reputed basis in the year 1134 was to make amends for a sin against the welfare of those more vulnerable in the past, by aiding the spiritual redemption of those presently less fortunate. In contrast, its fictional figurative reconstruction four hundred years later may have offered more tangible benefits to living viewers and their descendants than to their ancestor’s departed soul. Thus, the image of the chapel is at the same time a gesture to a past and, more importantly, a bequest to the future, signaling the family’s efforts to restore its reputation both in the 1530s and four hundred years earlier. The experience of privileges lost, but also renewed, which motivated the Zimmern barons’ campaign, had a visual component that included the production of paintings.70 The structure of the Zimmern Anamorphosis is ideally situated to make evident the human struggle to hold onto fleeting worldly privileges. The painting performs ephemerality, enacting the impermanence of everything mortal on the bodies of its subjects and its audience. It frustrates viewers’ attempts to view its sitters’ portraits as conventional pendants other than in the mind’s eye. The optical effects employed in the Zimmern Anamorphosis guide viewers to the realization that perpetuating its images happens more perfectly within mental processes than on the picture plane. The question remains as to whether viewers can ever unite all the parts into one coherent whole. Why did the soon-to-be counts of Zimmern choose to align their collective identity with the Stromberg-Frauenzimmern saga, instead of reminding viewers here, for example, of their ongoing investment in the Meßkirch parish church of Saint Martin, another site essential to their identity?76 As a recently renovated urban landmark, however, the latter could still be experienced in person, not only through words and images. Couched as literary and pictorial historiae, chronicles and pictures imply that events of long ago really happened.77 The overlapping time frames in the Zimmern Anamorphosis go even further than the family’s chronicle to produce memoria. Amid the entry for memoria in Petrus Dasypodius’ Latin-German dictionary, of 1535, are the related terms Memoriale as a “sign of remembrance” (ein zeichen von gedenck), and Commemoratio as both a narration and prophecy (Ein erzelung / vorsagung). Rememorio: bringing something into one’s memory again (Ich bring wider in gedechtnuß) is aligned with finding something familiar that had been set aside, perhaps momentarily forgotten.78 Memory is charged with bringing the forgotten back to mind. In the Zimmern Anamorphosis, memoria is performed in the Memoriale signified by the chapel, in the Commemoratio of the Stromberg Legend and unattended shield that awaits the next generation, and as Rememorio in the mobile manner in which the painting as a tangible object must be approached. It requires the viewer to look again from another position and to recall what has already been seen, retrieving embodied experiences into the present moment. Past, present, and future are intermingled in memory’s semantic field, as they are in the Zimmern Anamorphosis and how it is perceived. The artistic interleaving of figures and events that would be separated by temporal rifts, when arranged along a timeline, suggests how deeply they affect one and other. Can we find temporal distance reconciled in the here and now not only in memorials motivated by predominantly religious objectives but also in commemorative objects that foreground worldly content and serve secular ends? Replacing a linear model of time with a layered one permits perceiving otherwise disparate events through each other. Yet, the finite mortal eye must perceive disparate components serially; as humans, we can only collapse the series into one enfolded moment in our minds. To “eye awry” an image, we move from center to sidelines, from near to far, and back and forth. Oscillation between different vantage points leads not only to reckoning with the contingent nature of sight but also to comparing multiple subject positions. Images that appear to change before the eyes prompt viewers to assimilate what is temporally apart: the distant past in the historical imagery, which includes the once-present portrait subjects who have now become figures of the past, the former-future in the single coat-of-arms that projects the clan’s survival, and the ever-changing present experienced by the viewer. It would be difficult to overestimate the significance of the concept of historia memorabilis (memorable history) with respect to the content, format, and functions of the Zimmern Anamorphosis. It functions differently than a conventional Memorietafel, a commemorative religious painting before which the faithful are asked to recite prayers on behalf of its donor’s soul. In the latter, a patron may position his or her likeness to perpetually perform acts of devotion. Like a Memorietafel, however, the Zimmern Anamorphosis enlists viewers to complete a task on behalf of its patron(s), albeit not in a religious setting. Instead of performing piety, the painting dramatizes the dichotomy of the fleeting and the enduring by mobilizing viewers to complete its messages. For viewers outside the family, it may incite awareness of how reactivating a perishable identity—in this case, someone else’s—can also produce reflexive states. Marta Faust is a PhD candidate in the History of Art and Architecture at the University of California Santa Barbara. Her forthcoming dissertation, supervised by Mark A. Meadow, examines idiosyncratic uses of perspective and visual assessment in early sixteenth-century southern Germany. Research for this essay was supported by the Department of the History of Art and Architecture at the University of California Santa Barbara and an Albert and Elaine Borchard Foundation European Studies Fellowship. I am grateful to Mark A. Meadow; to fellow panelists and other listeners for their comments on earlier versions of this essay, which were presented at the College Art Association 104th Annual Conference, Los Angeles, in 2018; and at the annual symposium of the Early Modern Center, University of California Santa Barbara, in 2017. For assistance in Nuremberg, I thank Curator Thomas Eser and Conservator Benjamin Rudolph at the Germanisches Nationalmuseum. Thanks also to Ann Jensen Adams, Thomas Depasquale, David B. Feldman, Sophia Quach McCabe, JHNA Editor-in-Chief Alison Kettering, and the two anonymous reviewers whose suggestions helped to contextualize my ideas. Unless otherwise indicated, translations are mine. For aristocratic names, I have elected to retain the particles “de” and “von,” except for names used as adjectives or for family members collectively (e.g., “the Zimmern heirs,” or “the counts of Zimmern”). 1. Historians of linear perspective have often noted these sketches by Leonardo; among others, Martin Kemp, The Science of Art: Optical Themes in Western Art from Brunelleschi to Seurat, rev. ed. 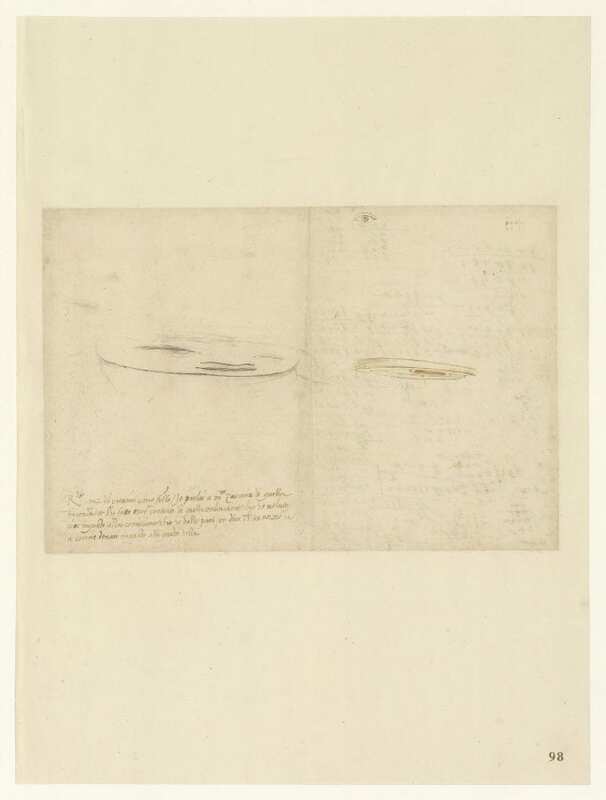 (New Haven: Yale University Press, 1992), 49–50; Lyle Massey, “Anamorphosis through Descartes or Perspective Gone Awry,” Renaissance Quarterly 50 (1997): 1166. https://doi.org/10.2307/3039406; This drawing of an eye represents but a fraction of Leonardo’s optical experiments. 2. William Shakespeare, King Richard II, annotated by Roma Gill (Oxford: Oxford University Press, 1998), act 2, scene 2: “Each substance of a grief hath twenty shadows / which shows like grief itself, but is not so; / for sorrow’s eye, glazed with blinding tears, / divides one thing entire to many objects; / like perspectives, which rightly gazed upon / show nothing but confusion, eyed awry / distinguish form.” This apt phrase is cited with near-ubiquity in the secondary literature on anamorphosis perspective, with notable contributions cited below. 3. The multivalent word perspective (from the Latin perspecio, perspicere, perspectum: “to see through” and “to see clearly”) was still largely synonymous with optics until late in the sixteenth century. A contemporary Latin-German dictionary equates perspicere with erkennen (to recognize). Petrus Dasypodius, ed., Voces Propemodum Universas in autoribus latinis probatis (Strasbourg: Wendelin Rihel, 1535), s.v. “Specio”: http://diglib.hab.de/drucke/n-77-4f-helmst-2/start.htm. Artists and other writers also designated techniques for creating illusionistic depth, and—especially in Italy—scenographic views of architecture (building elevations depicted at various angles) as “perspective(s),” and chose it as a key word in their publication titles until at least 1570. 4. This essay examines only the earliest type of anamorphic image: those whose optical adjustment can be achieved by sight alone, rather than requiring an external instrument, such as a mirror or lens. Device-dependent images proliferated from the 1590s onward. 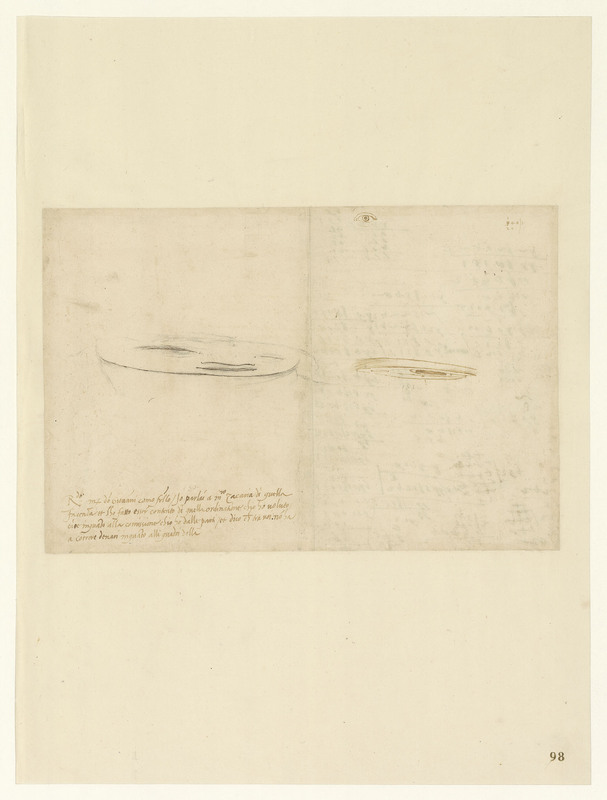 On the tripartite typology of “optic,” “catoptric,” and “dioptric” anamorphoses, see Jean-François Nicéron, La perspective curieuse (Paris: François Langlois, 1638): http://visualiseur.bnf.fr/ark:/12148/bpt6k105509h. 5. Jurgis Baltruŝaitis, Anamorphic Art, trans. W. J. Strachan (Anamorphoses ou perspectives curieuses, 1955; New York: Harry N. Abrams, 1977). Thomas Hensel astutely notes that Baltruŝaitis’s choice coincided with the commercial proliferation of “anamorphic lenses” for adapting film from wide-angle to 35mm and vice versa (“Mobile Augen: Pfade zu einer Geschichte des sich bewegenden Betrachters,” in Ich sehe was, was du nicht siehst! Sehmaschine und Bilderwelten: Die Sammlung Werner Nekes, exh. cat., ed. Bodo von Dewitz [Göttingen: Steidl, 2002], 54–63). Gaspar Schott coined the term anamorphotica as a broad category of re-formable images, in a chapter on the “art of dissimulation, secret displacement and correction” (Verstellt- oder Verstaltungskunst, geheime Verstellung und Wiederzurechtbringung). See Gaspar Schott, Magia optica, vol. 1 of Magia universalis naturae et artis, trans. M. F. H. M. (1657; Frankfurt a.M.: Johann Martin Schönwetter, 1677), 88: urn:nbn:de:bvb:12-bsb10053120-4. 6. Initial research on the Zimmern Anamorphosis (its modern title) was conducted by scientific instruments curator Thomas Eser for the exhibition catalogue, Schiefe Bilder: Das Zimmernsche Anamorphose und andere Augenspiele aus den Sammlungen des Germanischen Nationalmuseums, ed. Thomas Eser (Nuremberg: Germanisches Nationalmuseum, 1998). The painted dates’ third and fourth numerals are badly abraded. Due to its fragile condition, the Zimmern Anamorphosis (http://objektkatalog.gnm.de/objekt/WI717) has not been on permanent display. Thanks to Thomas Eser; and to paintings conservator Benjamin Rudolph for graciously introducing me to the object in the museum’s conservation laboratory. 7. On the museum acquisition, see Eser, Schiefe Bilder, 40. First catalogued at Nuremberg as an optical device in the collection of scientific objects in the early 1880s, the painting was never transferred to the collection of European paintings. 8. Shakespeare, Richard II, act 2, scene 2. 10. Kemp, Science of Art, 50; Kyung-Ho Cha and Markus Rautzenberg, “Einleitung: Im Theater des Sehens; Anamorphose als Bild und philosophische Metapher,” in Der entstellte Blick: Anamorphosen in Kunst, Literatur und Philosophie, ed. K.-H. Cha and M. Rautzenberg (Munich: Wilhelm Fink, 2008), 7–22; and that volume’s essays, which situate anamorphosis in art forms characterized by movement: theater, dance, and film, as well as in traditional word/image media. 11. On theoretical and practical writings by artists and by mathematicians of the Jesuit and Minim Orders, see, among others, Massey, “Anamorphosis through Descartes” https://doi.org/10.2307/3039406; Mersch, “Representation and Distortion”; and Hanneke Grootenboer, The Rhetoric of Perspective: Realism and Illusionism in Seventeenth-Century Dutch Still-Life Painting (Chicago: University of Chicago Press, 2004). 12. Grootenboer, Rhetoric of Perspective, 112–33. 13. Lyle Massey, Picturing Space, Displacing Bodies: Anamorphosis in Early Modern Theories of Perspective (University Park: Pennsylvania State University Press, 2007). 14. For a summary of Jacques Lacan’s statements on self-reflexive observation, see Daniel Collins, “Anamorphosis and the Eccentric Observer: Inverted Perspective and Construction of the Gaze,” Leonardo 25, no. 1 (1992): 73–82: https://muse.jhu.edu/article/606264. https://doi.org/10.2307/1575625, Embodied sight is also important for the recent studies noted above. 15. Offering the “anamorphic gaze” as a concept for scrutinizing deceptively illusionistic imagery, Grootenboer recommends treating nonanamorphic images to the same unconventional “mode of looking” that also applies to allegories (Rhetoric of Perspective, 132–33). See also Cha and Rautzenberg on the related “theatralization” of pictures made “kinetic” by their viewers (“Einleitung: Im Theater des Sehens,” 15); and, through the lens of cognitive science, the production of “higher-order self-related processes” through movement-based “anamorphic consciousness” in Zoltán Veres, “Hiding within Representation,” Journal of Consciousness Studies 15, no. 9 (2008), 134. 16. Exceptional for bearing the artist’s signature and date, Holbein’s Ambassadors was first documented at the Dinteville chateau at Polisy, France, in 1589, as noted by Susan Foister, Making and Meaning: Holbein’s Ambassadors, ed. Susan Foister, Ashok Roy, and Martin Wyld, exh. cat. (London: National Gallery, 1998), 25. On the putative transference of perspectival theory from Leonardo to Holbein and beyond, see Daniel Carmi Sherer, Anamorphosis and the Hermeneutics of Perspective from Leonardo to Hans Holbein the Younger, 1490–1533 (PhD diss., Harvard University, 2000): https://search.proquest.com/docview/304610107?accountid=14522. 17. For a thorough iconographic analysis of the astronomical instruments, see John North, The Ambassadors’ Secret: Holbein and the World of the Renaissance (London: Hambledon and London, 2002). 18. Susan Foister reads the painting as an expression of its subjects’ distressed mental states, which increases the weight of skull and crucifix as memento mori symbols (reminders of death). See “Death and Distortion: The Skull and the Crucifix,” in Making and Meaning: Holbein’s Ambassadors, ed. Susan Foister, Ashok Roy, and Martin Wyld, exh. cat. (London: National Gallery, 1998), 57. 19. This expression is inspired by the theological concept of “reconciliation [or coincidence] of opposites” coined by Nicholas of Cusa in his 1440 text, De docta ignorantia (On Learned Ignorance), and plays on Cusanus’s love of visual metaphors, such as divinity as “revealed but unrevealable vision” in De visione dei (On the Vision of God). See Nicholas of Cusa, Opera Omnia: https://urts99.uni-trier.de/cusanus/content; and Complete Philosophical and Theological Treatises of Nicholas of Cusa, trans. Jasper Hopkins (Minneapolis: Arthur J. Banning, 2001), 2:717. 20. On the conservation and partial restoration of the original frame, see Martina Homolka, “Konglomerat und Kuriosum: Die Zimmernsche Anamorphose: Zur Restaurierung eines perspektiven Doppelporträts und seiner Papiermaché-Ornamentik,” Restauro 104, no. 7 (1998): 480–85. 21. As uomini illustri, men whose accomplishments are to be emulated, the two identifiable medallions represent Matthias Corvinus, King of Hungary (r. 1458–90), at lower left, and Ludwig V, Electoral Prince of the Palatine (1478–1544), at lower center (http://objektkatalog.gnm.de/objekt/WI717). 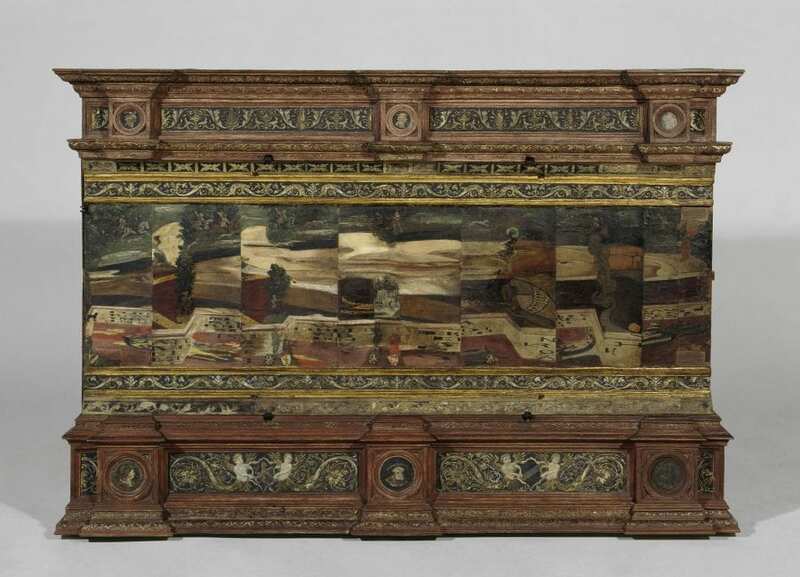 This essay focuses, however, on the painted panel within this complex frame. 22. On the Stromberg Legendʼs sources and motifs, see Gerhard Wolf, Von der Chronik zum Weltbuch: Sinn und Anspruch südwestdeutscher Hauschroniken am Ausgang des Mittelalters (Berlin: Walter de Gruyter, 2002), 216–19, https://doi.org/10.1515/9783110874112; and Franz-Josef Holznagel, “Ignorierte Warnungen armer Seele, lehrreiche Begegnungen mit den Ahnen und eine undankbare Wiedererweckte: Die ‘Gespenster’ des Wilhelm Werner von Zimmern (1485–1575) und ihre Funktionalisierungen,” in Gespenster: Erscheinungen, Medien, Theorien, ed. Moritz Baßler, Bettina Gruber, and Martina Wagner-Egelhaaf (Würzburg: Königshausen & Neumann, 2005), 62f, n27. 23. See Eser, Schiefe Bilder. For a fuller account of the Zimmern patronage of art and literature, see Casimir Bumiller, Bernhard Rüth, and Edwin Ernst Weber, eds., Mäzene, Sammler, Chronisten: Die Grafen von Zimmern und die Kultur des schwäbischen Adels, exh. cat. (Stuttgart: Belser, 2012). On the family history, see Clemens Joos, “Zimmern,” in Höfe und Residenzen im spätmittelalterlichen Reich: Ein dynastisch-topographisches Handbuch, ed. Werner Paravicini et al. (Ostfildern: Jan Thorbecke, 2012), 4, pt. 2:1766–76, with extensive literature. 24. On the role of exhortation in the Zimmern legends, see Holznagel, “Ignorierte Warnungen armer Seele,” 67. 25. The Zimmern Anamorphosis may have been initially displayed in the renowned, uncatalogued Wunderkammer assembled by Wilhelm Werner von Zimmern before it was dispersed just after 1594. Along with ancient coins, medallions, and a Latin and German library, the collection primarily held naturalia and mirabilia: stones, bones (i.e., relics), horns, and “antiquiteten und abentheür” (wondrous, valuable old things), as noted by Conrad Gesner, Thierbůch, trans. Conrad Forer (Zurich: Christoffel Froschower, 1563), fols. 65r, 67r: http://dx.doi.org/10.3931/e-rara-5027. 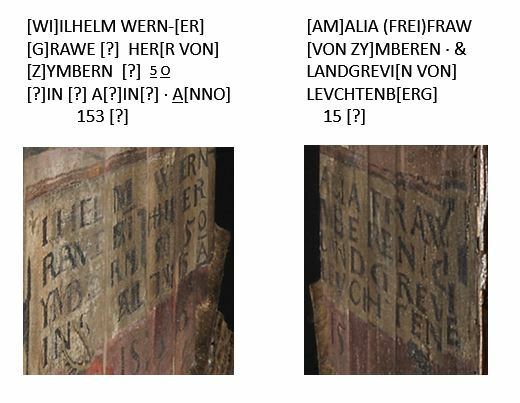 On the provenance of other Zimmern commissions, see Bernd Konrad, “Die Freiherren und Grafen von Zimmern als ‘Kunstmäzene,’” in Bumiller, Rüth, and Weber, Mäzene, Sammler, Chronisten, 189–203. 26. Joos, “Zimmern,” 4, pt. 2:1768, 1799. 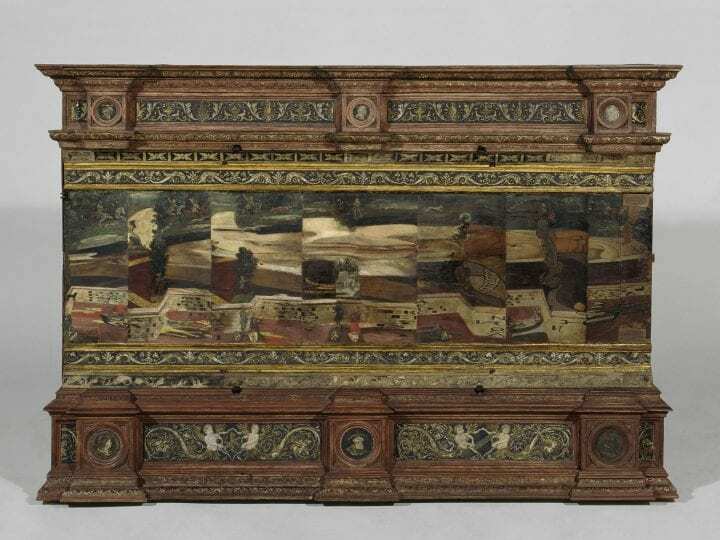 The object in question was listed as a “hilzene perspectivtafel mit Carolo quinto und herr graff Wilhelm zu Zimmern” (wooden perspective-panel with [Emperor] Charles V and Lord Count Wilhelm von Zimmern). Minus any imperial portrait, the painting was first inventoried at Nuremberg in 1881/82 (book WI 1–1921) as a “mirror image painted on wood” (Spiegelbild auf Holz gemalt). See Eser, Schiefe Bilder, 40n2. 27. Eser, Schiefe Bilder, supplies the prevailing iconographic interpretation. 28. On the persistence of bilde in reference to mental imagery in the context of high- and late-medieval courtly love texts (a genre championed by the nobility in general and the Zimmern in particular), see Horst Wenzel, Spiegelungen: Zur Kultur der Visualität im Mittelalter (Berlin: Erich Schmidt, 2009), 12. 29. The figures were first identified by Eser, Schiefe Bilder, from the account of the clan’s ancestry in its chronicle. See Froben Christoph, Count von Zimmern, Die Chronik der Grafen von Zimmern: Handschriften 580 und 581 der Fürstlich Fürstenbergischen Hofbibliothek Donaueschingen, 3 vols, ed. Hansmartin Decker-Hauff and Rudolf Seigel (Constance: Jan Thorbecke, 1964–72), 2:71. Compare the two-volume manuscript of 1564–66, Froben Christoph, Count von Zimmern, Zimmer’sche Chronik, transcribed by Johannes Müller (Stuttgart, Württembergische Landesbibliothek, Cod. Don. 580a/580b): http://digital.wlb-stuttgart.de/purl/bsz353085545 and http://digital.wlb-stuttgart.de/purl/bsz353087033. Citations from the chronicle (henceforth Chronik) below follow the Decker-Hauff and Seigel edition. See also Casimir Bumiller, “Die Herren und Grafen von Zimmern—Eine exemplarische oder eine extraordinäre Geschichte?” in Bumiller, Rüth, and Weber, Mäzene, Sammler, Chronisten, 18. 30. The Chronik identifies Elisabeth thus, although the Teck duchy—an extension of the Zähringer line—was first noted as such in 1187; see Rolf Götz, Wege und Irrwege frühneuzeitlicher Historiographie: Genealogisches Sammeln zu einer Stammfolge der Herzöge von Teck im 16. und 17. Jahrhundert (Ostfildern: Jan Thorbecke, 2007), 119, 195. Only from the mid-fourteenth century onwards are the Zimmern wives’ names well documented. See Detlev Schwennicke, ed., Europäische Stammtafeln: Stammtafeln zur Geschichte der Europäischen Staaten (Marburg: J. A. Stargardt, 1993), vol. 12, tables 83–84. 31. Iron fittings bordering the painted panel indicate lost hinged wings or shutters, which may have held viewing apertures (Eser, Schiefe Bilder, 24–25, fig. 8). 32. Gabriele Heidenreich, Schloss Meßkirch: Repräsentation adeligen Herrschaftsbewusstseins im 16. Jahrhundert (Tübingen: Bibliotheca-Academica, 1998), 126. 33. The eldest brother, Veit Werner (1479–1499), predeceased the social elevation. 34. See Schwennicke, Europäische Stammtafeln, vol. 16, tables 4 and 99. 35. For Amalia’s maternal lineage through Johanna von Bavaria-Landshut (1413–1444), see the Wittelsbach family tree in Schwennicke, Europäische Stammtafeln, vol. 1.1, table 104. 36. Chronik, 1:91–94; Cod. Don. 580a, 80ff; and Cod. Don. 580b, 1423–24 (see above, note 29). 37. The forest setting may be held as an example of the “green world” topos in the Renaissance literary imagination, an alternate, fictional world intended “to offer a clarified image of the world it replaces,” as posed by Harry Berger, Jr., Second World and Green World: Studies in Renaissance Fiction-making (Berkeley: University of California Press, 1988), 111. 39. On late medieval Christian beliefs about the postmortem soul, see Jacques Le Goff, The Birth of Purgatory, trans. Arthur Goldhammer (Aldershot: Scolar Press, 1990); Jean-Claude Schmitt, Ghosts in the Middle Ages: The Living and the Dead in Medieval Society, trans. Theresa Lavender Fagan (Chicago: University of Chicago Press, 1998); Peter Dinzelbacher, Vision und Visionsliteratur im Mittelalter (Stuttgart: Anton Hiersemann, 1981); Peter Dinzelbacher, Angst im Mittelalter: Teufels-, Todes- und Gotteserfahrung: Mentalitätsgeschichte und Ikonographie (Paderborn: Ferdinand Schöningh, 1996); and Eileen Gardner, Medieval Visions of Heaven and Hell: A Sourcebook (New York: Garland, 1993). 40. See the argument advanced by Holznagel, “Ignorierte Warnungen armer Seele,” 64, and echoed by Hans Harter, “Das edle Schloss Zimbre—Burg und Adel von Zimmern vom 10. bis 12. Jahrhundert,” in Bumiller, Rüth, and Weber, Mäzene, Sammler, Chronisten, 28–30. 41. Holznagel, “Ignorierte Warnungen armer Seele,” 64n29, argues that as chronicle writer, Froben Christof strove to enhance his family’s reputation by embellishing its origins with a lengthier pedigree based on speculative links between his family’s name and southwest German place-names. 42. Records in the Württembergisches Hauptstaatarchiv at Stuttgart confirm Magenheim patronage of the women’s convent at Frauenzimmern (a village southwest of Heilbronn). On the convent’s historical record, see Maria M. Rückert, “Zur Inkorporation südwestdeutscher Frauenklöster in den Zisterzienserorden: Untersuchungen zu den Zisterzen der Maulbronner Filiation im 12. und 13. Jahrhundert,” Studien und Mitteilungen zur Geschichte des Benediktinerordens und seiner Zweige 111 (2000): 388–90. Without an extant statute of incorporation, this former convent is not officially counted by the Cistercian Order. 43. Since Amalia died four months before her husband’s promotion, her married title of baroness remained intact. 44. Nor can they be compared with contemporaneous physiognomic portraits. Repeated retouching has rendered the original handiwork difficult to identify. 45. Egnatio Danti and Giacomo Barozzi da Vignola, Le due regole della prospettiva practica (Rome: Francesco Zanetti, 1583): https://ia802606.us.archive.org/31/items/dveregoledellapr00vign/dveregoledellapr00vign.pdf. 46. Danti and Vignola, Le due regole, 96: “Et si deue usare molta diligenza in far che la tauola, nella quale si fa la pittura, che farà il fondo della cassetta PQ, sia eccellentemente piana, atteso che ogni poco di colmo, ò concauo che ui fusse, impedirebbe che non si potesse uedere tutto quello che ui è dipinto.” Thanks to Thomas Depasquale for assistance with this translation. 47. Slightly earlier, Venetian scholar and diplomat Daniele Barbaro noted an artistic technique for concealing a picture’s true subject—unless seen from a “predetermined point” (punto determinate)—in a short chapter on “perspettiva artificialia” (constructed perspective, as opposed to natural perspective, i.e., optics), in La practica della perspettiva (Venice: Camillo and Rutilio Borgominieri, 1569), 159–60: https://ia802703.us.archive.org/24/items/gri_33125008285765/gri_33125008285765.pdf. Compare Danti and Vignola, Le due regole, 95–96. 48. While this equation is not exact, the two recollective concepts share phenomenological qualities. On Endel Tulving’s concept of episodic memory, see Johannes B. Mahr and Gergely Csibra, “Why Do We Remember? The Communicative Function of Episodic Memory,” Behavioral and Brain Sciences (2018): 1–16: https://doi.org/10.1017/S0140525X17000012. 49. Compare Thomas A. Brady, Jr., “The Urban Milieu: Patricians, Nobles, Merchants: Internal Tensions and Solidarities in South German Ruling Classes at the Close of the Middle Ages,” in Social Groups and Religious Ideas in the Sixteenth Century, ed. Miriam Usher Chrisman and Otto Gründler (Kalamazoo: Western Michigan University Press, 1978), 38–45; and Norbert Schindler, Rebellion, Community and Custom in Early Modern Germany, trans. Pamela E. Selwyn (Cambridge: Cambridge University Press, 2002). 50. Codification of patrilineal inheritance and primogeniture in southern Germany destabilized families whose social status depended on privileges such as land use and honorifics. 51. See Simon Teuscher, “Male and Female Inheritance: Property Devolution, Succession, and Credit in Late Medieval Nobilities in the Southwest of the Holy Empire,” in The Economic Role of the Family in the European Economy from the 13th to the 18th Centuries/La famiglia nell’economia europea secc. XIII–XVIII, ed. Simonetta Cavaciocchi (Florence: Firenze University Press, 2009), 599–618. By the sixteenth century, nobles often sent their daughters into marriage with letters of indemnity for dowries, many of which were never resolved during the lifetimes of the widows they were intended to support (Teuscher, “Male and Female Inheritance,” 604–10). 52. Compare Wolf, Von der Chronik zum Weltbuch; with Erica Bastress-Dukehart, The Zimmern Chronicle: Nobility, Memory, and Self-representation in Sixteenth Century Germany (Aldershot: Ashgate, 2002), 38–47, who reads both chronicle and painting as sets of riddles. For the Chronik’s persistent advocacy for prudent alliances, see Judith L. Hurwich, Noble Strategies: Marriage and Sexuality in the Zimmern Chronicle (Kirksville, Mo. : Truman State University Press, 2006). 54. See Bumiller, Rüth, and Weber, Mäzene, Sammler, Chronisten, cat. 27. Unlike prior imperial bans, this one ordered the capture, torture, and delivery of guilty parties, not merely expulsion. Johann Werner the Elder, however, found refuge with the emperor’s son-in-law, Albrecht IV, Duke of Bavaria-Munich (1447–1508). 56. The Counts of Werdenberg benefitted most from Johann Werner’s banishment. 57. Trugenberger, 750 Jahre Stadt Meßkirch, following the Chronik. 58. See Stephen Wendehorst and Siegrid Westphal, “Imperial Personnel in the Early Modern Period? Reflections on the Concept and the Contours of a Functionary Elite of the Holy Roman Empire,” in Reichspersonnel: Funktionsträger für Kaiser und Reich, ed. Anette Baumann (Cologne et al. : Böhlau, 2003), 379–98. 60. Andreas Bihrer, “Habitus und Praktiken eines gelehrten Adeligen: Leben und Werk Graf Wilhelm Werners von Zimmern,” in Bumiller, Rüth, and Weber, Mäzene, Sammler, Chronisten, 110. In his new standing as imperial count, Wilhelm Werner advanced in 1541 to a higher judicial office, but resigned the following year. He returned as Chief Justice from 1548 through 1554. 61. Bihrer, “Habitus und Praktiken eines gelehrten Adeligen,” 109–10. 66. Brady, “The Urban Milieu,” 41. 67. The convent site’s proper name, the plural Frauenzimmern, meant a small, autonomous residential community—sometimes partitioned off within a larger building—governed by a noblewoman, and in the early-modern period, one or more women and their lodgings. Pejorative use, as for the English wench, developed after the seventeenth century. 68. The Etymologies of Isadore of Seville, trans. Stephen A. Barney et al., Book 15, part 8: “Fields (De agris),” part 4 (Cambridge: Cambridge University Press, 2006), 314. 69. Le Goff, Birth of Purgatory, 209. 70. For other Zimmern-commissioned works of art, see Konrad, “Die Freiherren und Grafen von Zimmern,” in Bumiller, Rüth, and Weber, Mäzene, Sammler, Chronisten, 189–203. 71. Unlike modern notions of identity that presume (relatively) stable mental and/or physical characteristics, “identity” in this context indicates how persons were recognized or acknowledged by other subjects through resemblance (similitude). 72. Holznagel (“Ignorierte Warnungen armer Seele,” 67) argues for reading the damaged date as 1538 because the title of “Graf” (Count) is used, with Amalia’s death as terminus ante quem for an epitaph, a function that Eser had dismissed as inappropriate for the format (Schiefe Bilder, 43n12). 73. On elite memory culture, see Otto Gerhard Oexle, introduction to Memoria als Kultur (Göttingen: Vandenhoeck & Ruprecht, 1995), 38. 74. Oexle, Memoria als Kultur, 37–38n158. See also Otto Gerhard Oexle, “Aspekte der Geschichte des Adels im Mittelalter und in der Frühen Neuzeit,” in Europäischer Adel 1750–1950, ed. Hans-Ulrich Wehler (Göttingen: Vandenhoeck & Ruprecht, 1990), 19–56. 75. These terms are prominent in the aggrandizing, pseudobiographical, image-laden memorial projects commissioned by the Emperor Maximilian I. See, for example, Marx Treitzsaurwein et al. Der Weiß-Kunig: eine Erzählung von den Thaten Kaiser Maximilian des Ersten (Vienna: Joseph Kurzböck, 1775). See also Jörg Jochen Berns, “Gedächtnis und Arbeitsteiligkeit: Zum gedechtnus-Konzept Maximilians im Kontext mnemonischer Programme und enzyklopädischer Modelle seiner Zeit,” in Maximilians Ruhmeswerk: Künste und Wissenschaften im Umkreis Kaiser Maximilians I., ed. Jan-Dirk Müller and Hans-Joachim Ziegler (Berlin: Walter de Gruyter, 2015), 69–106 https://doi.org/10.1515/9783110351026-006; and Larry Silver, Marketing Maximilian: The Visual Ideology of a Holy Roman Emperor (Princeton: Princeton University Press, 2008). 76. As analyzed by Helmut Maurer, “Zwischen Selbständigkeit und politischer Integration: Begräbniskultur und Residenzbildung im hohen Adel des deutschen Südwestens am Beispiel der Grafen von Zimmern,” in Macht und Memoria: Begräbniskultur europäischer Oberschichten in der Frühen Neuzeit, ed. Mark Hengerer (Cologne: Böhlau, 2005), 163–86. 79. Nicholas of Cusa, “On Learned Ignorance,” trans. Jasper Hopkins, in Complete Philosophical Treatises, 1:65; Nicholas of Cusa, De docta ignorantia, in Opera Omnia: “Ita nunc sive praesentia complicat tempus. Praeteritum fuit praesens, futurum erit praesens; nihil ergo reperitur in tempore nisi praesentia ordinata. Praeteritum igitur et futurum est explicatio praesentis; praesens est omnium praesentium temporum complicatio, et praesentia tempora illius seriatim sunt explicatio, et non reperitur in ipsis nisi praesens” (2:3, 106). Baltruŝaitis, Jurgis. Anamorphic Art. Translated by W. J. Strachan. New York: Harry N. Abrams, 1977. Originally published as Anamorphoses ou perspectives curieuses. Paris: Olivier Perrin, 1955. Barbaro, Daniele. La practica della prospettiva. Venice: Camillo and Rutilio Borgominieri, 1569. https://ia802703.us.archive.org/24/items/gri_33125008285765/gri_33125008285765.pdf. _______. The Zimmern Chronicle: Nobility, Memory, and Self-representation in Sixteenth Century Germany. Aldershot: Ashgate, 2002. Berger, Harry, Jr. Second World and Green World: Studies in Renaissance Fiction-making. Berkeley: University of California Press, 1988. Bihrer, Andreas. “Habitus und Praktiken eines gelehrten Adeligen: Leben und Werk Graf Wilhelm Werners von Zimmern.” In Mäzene, Sammler, Chronisten: Die Grafen von Zimmern und die Kultur des schwäbischen Adels, exh, cat., edited by Casimir Bumiller, Bernhard Rüth, and Edwin Ernst Weber, 107–18. Stuttgart: Belser, 2012. Brady, Thomas A., Jr. “The Urban Milieu: Patricians, Nobles, Merchants: Internal Tensions and Solidarities in South German Ruling Classes at the Close of the Middle Ages.” In Social Groups and Religious Ideas in the Sixteenth Century, edited by Miriam Usher Chrisman and Otto Gründler, 38–45. Kalamazoo: Western Michigan University Press, 1978. Briški, Marija Javor. Die Zimmerische Chronik: Studien zur Komik als Medium der Dialogisierung des historischen Diskurses. Frankfurt a.M.: Peter Lang, 2004. Bumiller, Casimir. “Die Herren und Grafen von Zimmern—Eine exemplarische oder eine extraordinäre Geschichte?” In Mäzene, Sammler, Chronisten: Die Grafen von Zimmern und die Kultur des schwäbischen Adels, exh. cat., edited by Casimir Bumiller, Bernhard Rüth, and Edwin Ernst Weber, 16–27. Stuttgart: Belser, 2012. Bumiller, Casimir, Bernhard Rüth, and Edwin Ernst Weber, eds. Mäzene, Sammler, Chronisten: Die Grafen von Zimmern und die Kultur des schwäbischen Adels. Exh. cat. Stuttgart: Belser, 2012. Cha, Kyung-Ho, and Markus Rautzenberg. “Einleitung: Im Theater des Sehens: Anamorphose als Bild und philosophische Metapher.” In Der entstellte Blick: Anamorphosen in Kunst, Literatur und Philosophie, edited by Kyung-Ho Cha and Markus Rautzenberg, 7–22. Munich: Wilhelm Fink, 2008. Danti, Egnatio, and Giacomo Barozzi da Vignola. Le due regole della prospettiva practica. Rome: Francesco Zanetti, 1583. https://ia802606.us.archive.org/31/items/dveregoledellapr00vign/dveregoledellapr00vign.pdf. Dasypodius, Petrus, ed. Voces Propemodum Universas in autoribus latinis probatis. Strasbourg: Wendelin Rihel, 1535. http://diglib.hab.de/drucke/n-77-4f-helmst-2/start.htm. Dinzelbacher, Peter. Vision und Visionsliteratur im Mittelalter. Stuttgart: Anton Hiersemann, 1981. _______. Angst im Mittelalter: Teufels-, Todes- und Gotteserfahrung: Mentalitätsgeschichte und Ikonographie. Paderborn: Ferdinand Schöningh, 1996. Eser, Thomas, ed. Schiefe Bilder: Das Zimmernsche Anamorphose und andere Augenspiele aus den Sammlungen des Germanischen Nationalmuseums. Exh. cat. Nuremberg: Germanisches Nationalmuseum, 1998. The Etymologies of Isadore of Seville. Translated by Stephen A. Barney et al. Cambridge: Cambridge University Press, 2006. Foister, Susan, “Death and Distortion: The Skull and the Crucifix.” In Making and Meaning: Holbein’s Ambassadors, exh. cat., edited by Susan Foister, Ashok Roy, and Martin Wyld, 44–57. London: National Gallery, 1998. Foister, Susan, Ashok Roy, and Martin Wyld, eds. Making and Meaning: Holbein’s Ambassadors. Exh. cat. London: National Gallery, 1998. Gesner, Conrad. Thierbůch. Translated by Conrad Forer. Zurich: Christoffel Froschower [Froschauer], 1563. http://dx.doi.org/10.3931/e-rara-5027. Götz, Rolf. Wege und Irrwege frühneuzeitlicher Historiographie: Genealogisches Sammeln zu einer Stammfolge der Herzöge von Teck im 16. und 17. Jahrhundert. Ostfildern: Jan Thorbecke, 2007. Grootenboer, Hanneke. The Rhetoric of Perspective: Realism and Illusionism in Seventeenth-Century Dutch Still-Life Painting. Chicago: University of Chicago Press, 2004. Harter, Hans. “Das edle schloss Zimbre—Burg und Adel von Zimmern vom 10. bis 12. Jahrhundert.” In Mäzene, Sammler, Chronisten: Die Grafen von Zimmern und die Kultur des schwäbischen Adels, exh. cat., edited by Casimir Bumiller, Bernhard Rüth, and Edwin Ernst Weber, 28–40. Stuttgart: Belser, 2012. Heidenreich, Gabriele. Schloss Meßkirch: Repräsentation adeligen Herrschaftsbewusstseins im 16. Jahrhundert. Tübingen: Bibliotheca Academica, 1998. Hensel, Thomas. “Mobile Augen: Pfade zu einer Geschichte des sich bewegenden Betrachters.” In Ich sehe was, was du nicht siehst! Sehmaschine und Bilderwelten: Die Sammlung Werner Nekes, exh. cat., edited by Bodo von Dewitz, 54–63. Göttingen: Steidl, 2002. Holznagel, Franz-Josef. “Ignorierte Warnungen armer Seele, lehrreiche Begegnungen mit den Ahnen und eine undankbare Wiedererweckte: Die ‘Gespenster’ des Wilhelm Werner von Zimmern (1485–1575) und ihre Funktionalisierungen.” In Gespenster: Erscheinungen, Medien, Theorien, edited by Moritz Baßler, Bettina Gruber, and Martina Wagner-Egelhaaf, 55–76. Würzburg: Königshausen & Neumann, 2005. Homolka, Martina. “Konglomerat und Kuriosum: Die Zimmernsche Anamorphose: Zur Restaurierung eines perspektiven Doppelporträts und seiner Papiermaché-Ornamentik.” Restauro 104, no. 7 (1998): 480–85. Hurwich, Judith J. Noble Strategies: Marriage and Sexuality in the Zimmern Chronicle. Kirksville, Mo. : Truman State University Press, 2006. Joos, Clemens. “Zimmern.” In Höfe und Residenzen im spätmittelalterlichen Reich: Ein dynastisch-topographisches Handbuch, edited by Werner Paravicini, Jan Hirschbiegel, Anna Paulina Orlowska, and Jörg Wettlaufer, vol. 4, part 2. Ostfildern: Jan Thorbecke, 2012. Kemp, Martin. The Science of Art: Optical Themes in Western Art from Brunelleschi to Seurat. Rev. ed. New Haven: Yale University Press, 1992. Konrad, Bernd. “Die Freiherren und Grafen von Zimmern als ‘Kunstmäzene.ʼ” In Mäzene, Sammlern, Chronisten: Die Grafen von Zimmern und die Kultur des schwäbischen Adels, exh. cat., edited by Casimir Bumiller, Bernhard Rüth, and Edwin Ernst Weber, 189–203. Stuttgart: Belser, 2012. Le Goff, Jacques. The Birth of Purgatory. Translated by Arthur Goldhammer. Aldershot: Scolar, 1990. Mahr, Johannes B., and Gergely Csibra. “Why Do We Remember? The Communicative Function of Episodic Memory.” Behavioral and Brain Sciences (2018): 1–16. http://doi:10.1017/S0140525X17000012. Massey, Lyle. “Anamorphosis through Descartes or Perspective Gone Awry.” Renaissance Quarterly 50 (1997): 1148–87. https://www.jstor.org/stable/3039406. https://doi.org/10.2307/3039406. _______. Picturing Space, Displacing Bodies: Anamorphosis in Early Modern Theories of Perspective. University Park: Pennsylvania State University Press, 2007. Maurer, Helmut. “Zwischen Selbständigkeit und politischer Integration: Begräbniskultur und Residenzbildung im hohen Adel des deutschen Südwestens am Beispiel der Grafen von Zimmern.” In Macht und Memoria: Begräbniskultur europäischer Oberschichten in der Frühen Neuzeit, edited by Mark Hengerer, 163–86. Cologne: Böhlau, 2005. Mersch, Dieter. “Representation and Distortion: On the Construction of Rationality and Irrationality in Early Modern Modes of Representation.” In Instruments in Art and Science: On the Architectonics of Cultural Boundaries in the 17th Century, edited by Helmar Schramm, Ludger Schwarte, and Jan Lazardzig, 20–37. Berlin: Walter de Gruyter, 2005. Nicéron, Jean-François. La perspective curieuse. Paris: François Langlois, 1638. http://visualiseur.bnf.fr/ark:/12148/bpt6k105509h. Nicholas of Cusa. Opera Omnia. http://urts99.uni-trier.de/cusanus/content. North, John. 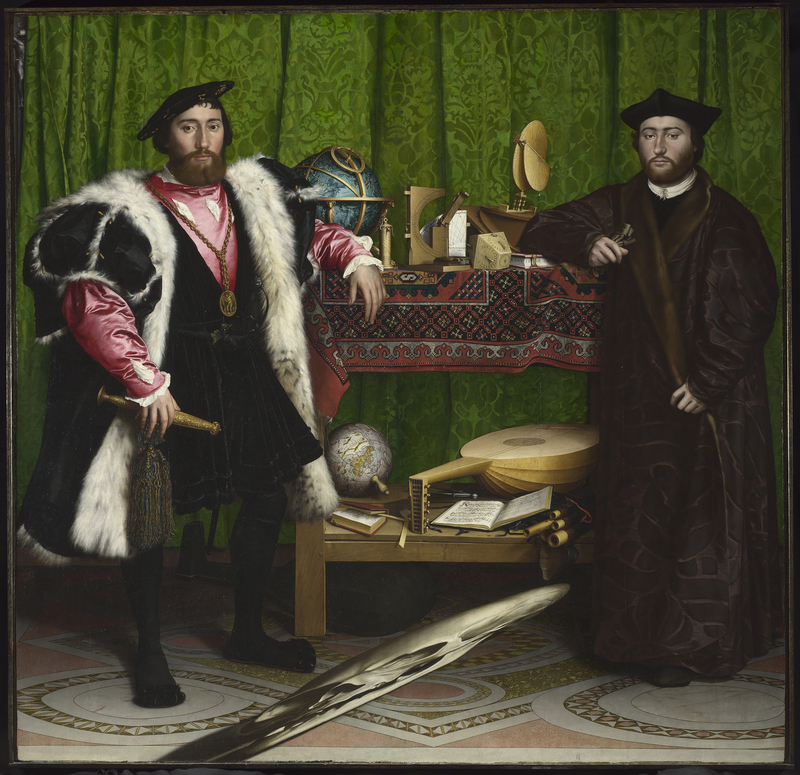 The Ambassadors’ Secret: Holbein and the World of the Renaissance. London: Hambledon and London, 2002. _________. Complete Philosophical and Theological Treatises of Nicholas of Cusa. 2 vols. Translated by Jasper Hopkins. Minneapolis: Arthur J. Banning, 2001. Oexle, Otto Gerhard. “Aspekte der Geschichte des Adels im Mittelalter und in der Frühen Neuzeit.” In Europäischer Adel 1750–1950, edited by Hans-Ulrich Wehler, 19–56. Göttingen: Vandenhoeck & Ruprecht, 1990. _______. Memoria als Kultur. Göttingen: Vandenhoeck & Ruprecht, 1995. Rückert, Maria M. “Zur Inkorporation südwestdeutscher Frauenklöster in den Zisterzienserorden: Untersuchungen zu den Zisterzen der Maulbronner Filiation im 12. und 13. Jahrhundert.” Studien und Mitteilungen zur Geschichte des Benediktinerordens und seiner Zweige 111 (2000): 381–410. Schmitt, Jean-Claude. Ghosts in the Middle Ages: The Living and the Dead in Medieval Society. Translated by Teresa Lavender Fagan. Chicago: University of Chicago Press, 1998. Schott, Gaspar. Magia Optica. Vol. 1 of Magia universalis naturae et artis. 1657. Translated by M. F. H. M. Frankfurt a.M.: Johann Martin Schönwetter, 1677. urn:nbn:de:bvb:12-bsb10053120-4. Schwennicke, Detlev. Europäische Stammtafeln: Stammtafeln zur Geschichte der Europäischen Staaten. New series. 16 vols. Marburg: J. A. Stargardt, 1978–95. Shakespeare, William. King Richard II. Annotated by Roma Gill. Oxford: Oxford University Press, 1998. Sherer, Daniel Carmi. Anamorphosis and the Hermeneutics of Perspective from Leonardo to Hans Holbein the Younger, 1490–1533. PhD diss., Harvard University, 2000. https://search.proquest.com/docview/304610107?accountid=14522. Schindler, Norbert. Rebellion, Community and Custom in Early Modern Germany. Translated by Pamela E. Selwyn. Cambridge: Cambridge University Press, 2002. Teuscher, Simon. “Male and Female Inheritance: Property Devolution, Succession, and Credit in Late Medieval Nobilities in the Southwest of the Holy Empire.” In The Economic Role of the Family in the European Economy from the 13th to the 18th Centuries/La famiglia nell’economia europea secc. XIII–XVIII, edited by Simonetta Cavaciocchi, 599–618. Florence: Firenze University Press, 2009. Treitzsaurwein, Marx, et al. Der Weiß-Kunig: Eine Erzählung von den Thaten Kaiser Maximilian des Ersten. Vienna: Joseph Kurzböck, 1775. Trugenberger, Volker. 750 Jahre Stadt Meßkirch: Beiträge zur Stadtgeschichte. Meßkirch: Armin Gmeiner, 2011. Veres, Zoltán. “Hiding within Representation.” Journal of Consciousness Studies 15, no. 9 (2008): 131–35. Wendehorst, Stephen, and Siegrid Westphal. “Imperial Personnel in the Early Modern Period? Reflections on the Concept and the Contours of a Functionary Elite of the Holy Roman Empire.” In Reichspersonnel: Funktionsträger für Kaiser und Reich, edited by Anette Baumann, 379–98. Cologne: Böhlau, 2003. Wenzel, Horst. Spiegelungen: Zur Kultur der Visualität im Mittelalter. Berlin: Erich Schmidt, 2009. Zimmern, Froben Christoph, Count von. Zimmer’sche Chronik. 2 vols. Transcribed by Johannes Müller [1564–66]. Stuttgart, Württembergische Landesbibliothek, Cod. Don. 580a/580b. http://digital.wlb-stuttgart.de/purl/bsz353085545 and http://digital.wlb-stuttgart.de/purl/bsz353087033. _______. Die Chronik der Grafen von Zimmern: Handschriften 580 und 581 der Fürstlich Fürstenbergischen Hofbibliothek Donaueschingen. 3 vols. Edited by Hansmartin Decker-Hauff and Rudolf Seigel. Constance: Jan Thorbecke, 1964–72.